The Pennsylvania woman was visiting for her bachelorette party when she lost the band worth more than $20,000, police said. A Suffolk County police officer Sunday reunited a bride-to-be with her engagement ring, which she lost in the sand at Fire Island, police said. The Pennsylvania woman was visiting Fire Island for her bachelorette party when she lost the band worth more than $20,000, police said. Marine Bureau Police Officer Robert Warrington searched Saturday at the house where the party had stayed and at the beach near Atlantique, but had no luck. The woman’s wedding is planned for this weekend and she was desperate to get the ring back, so Warrington called fellow bureau Officer Edmund McDowell to ask if he could bring his personal metal detector to help search. On Sunday, McDowell looked around the area where the group had laid out, slowly sweeping over the sand with his metal detector. He found the ring about 15 minutes later, along with a dime, a quarter and a rusty screw, McDowell said. When McDowell scooped it up and stuffed the ring with its large round-cut diamond onto his pinkie finger, he said everyone on the beach let out a cheer. McDowell gave the ring along with the other items he found on the beach to the bride’s friend, who had stayed behind to help in the search. “We called her up and she was crying and crying,” McDowell said. It’s the second time McDowell has used his detector find a ring at Fire Island. 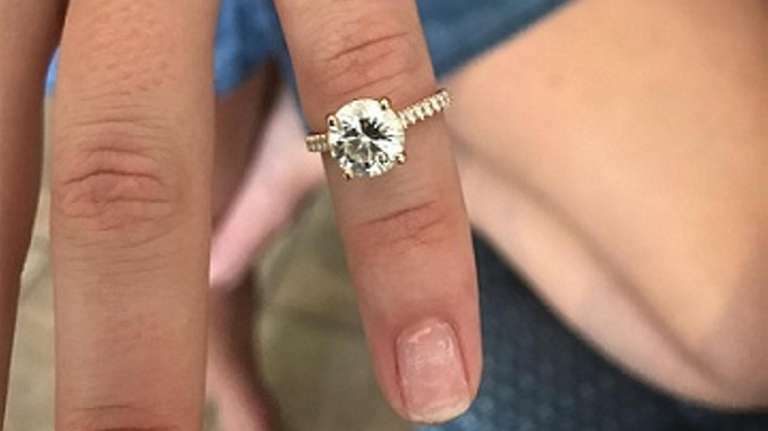 About eight years ago, McDowell got another call from Warrington, this time to ask if he’d help find a $30,000 platinum and diamond wedding band for a man who lost it while playing volleyball. “He’s such a nice guy and always goes above and beyond, and I like to help too, so between the two of us, I think we make a pretty good team,” McDowell said.